Animal Wildlife | Hippopotamus | The hippo (hippopotamus) spends most of its time wallowing in lakes and rivers in the jungles of western Africa. Hippos are generally solitary animals but can often be found in groups of between 5 and 30 hippo individuals. 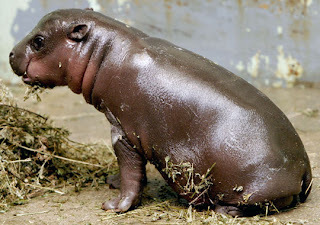 Even though the hippo has a pig-like appearance, the closet mammal relatives to the hippo are the whale and the porpoise both of which are found in the oceans. 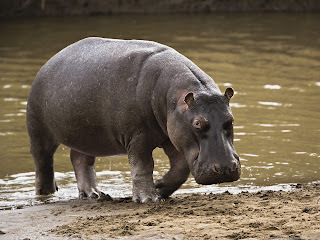 Despite the fact that hippos are roughly the same size and weight of a rhino, some hippos have been seen running at speeds of up to 30mph and the hippo is therefore seen to be the third heaviest animals in the world. 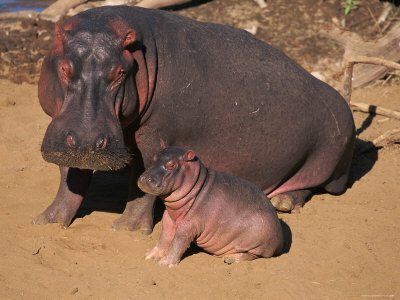 Apparently the hippo has pink sweat, which not only cools the hippo down when the hippo gets too hot, but also has antibacterial properties helping to fight infection in the thick skin of the hippo when the hippo is bitten or injured when fighting, generally with rival hippos. 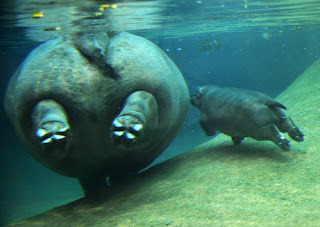 The hippo is also remarkable for the fact that it can take in enough air to stay underwater for half an hour before the hippo needs to resurface again, an astonishing feet seeing as the hippo is a mammal and therefore does not have gills that aid the animal in breathing underwater. 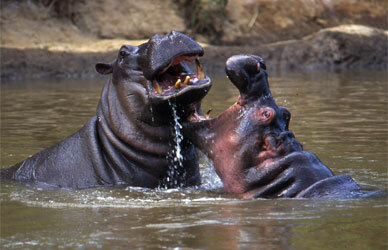 Many people think that large animals such as hippos are lazy and docile and will therefore pose no threat to humans. The hippo is known to be one of Africas most dangerous animals as when you combine the sheer size of the hippo, the territorial temperament of the hippo and the fact that a hippo is capable of running at immense pace (and can easily outrun a human) a wild hippo can therefore become extremely dangerous. The average hippo spends most of the hot daytime cooling itself in the colder water environment in the African jungle. At night time, however it is very common for hippos to leave their watery environment and to venture onto the surrounding grass plains that are much cooler when the hot African sun has gone down. Despite the immense size of the hippo, hippos have a nearly completely herbivorous diet, as the hippos munch on aquatic water plants during the day and the hippo is capable of eating around 50kg of grass in one go in the cooler night. The hippo has large tusks at the front of the mouth of the hippo which are capable of growing to more than a foot in length. The hippo mainly uses these tusks for fighting off predators and rival hippos and the hippo can therefore give another large animal a near fatal bite. When hippos have to resort to killing large mammals in order to defend themselves, it is extremely rare for the hippo to actually eat the kill afterwards. The head of the hippo is enormous making up around a third of the total weight of the hippo. The head of the hippo conceals the large tusks within the mouth of the hippo and the eyes, ears and nose of the hippo are found on the top of the head of the hippo. The sensory organs of the hippo are of the best advantage on the top of the head, meaning that when the hippo has its body submerged under the water to keep cool, the hippo can still see, hear and smell what is going on around it. There are thought to be around five different species of hippo found throughout the watery wilderness in African, but scientists claim that the differences between the different hippo species are very small. The most notable difference between hippo species is that the pygmy hippopotamus is roughly half the size of the larger common hippopotamus. The hippo cannot swim but uses its feet to push itself off the bottom of the riverbed to move around smoothly in the water. The hippo has flexible skin in between its toes, and these webbed feet of the hippo allow the hippo to be more graceful when moving around in the water. The foot of the hippo has four webbed toes which spread out to both support the weight of the hippo and allowing the hippo to easily walk on land. The large feet and short legs of the hippo, allow the hippo to be surprisingly agile as the hippo is even able to outrun a human both on land and in water. The hippo has the ability to climb up and down slippery river banks with no problems thanks to the webbed feet of the hippo. The hippo has an enormous mouth that conceals its enormous teeth, that can measure over half a meter in width and makes up around a third of its total weight. The canine teeth of the hippo are about a foot in length and are very sharp, despite the fact that hippos eat no meat as the hippo is a herbivore. The tusk like teeth of the hippo are made from ivory and grow continuously which keeps the teeth of the hippo very white and they are often killed by humans for them. 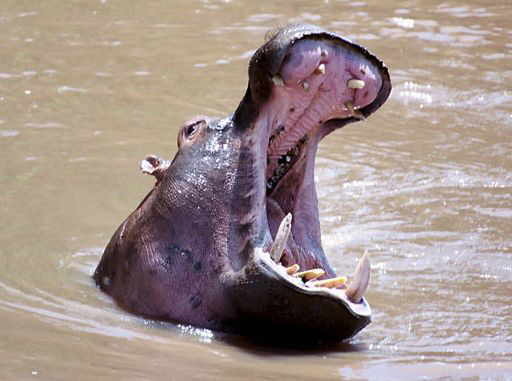 The hippo uses its large mouth and teeth to graze on grass on the land, mainly at night, with the hippo being able to consume nearly 50 kg of grass in one sitting. A hippo can open its mouth to make it four foot wide to show the four sharp tusks of the hippo, and this also plays a vital role in the hippo defending itself from company.